This word is surrounded by more mystery than an earnest etymologist would like. It appears in 1752 without any warning or antecedent in part four of a book by William and John Halfpenny with the title New Designs for Chinese Temples, an influential work that was aimed at the then new English fashion for the oriental in design and architecture. 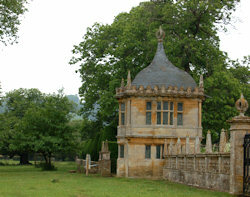 Early gazebos were often a tower on the roof of a house, a projecting balcony, or a structure attached to the top of a wall. Only much later was the word applied to a summerhouse, usually one with open sides. To be strict about it, only those edifices with a good view may be given that name; all others are mere shelters. Last modified: 31 July 2004.